This makes a ton of delicious cheese dip. 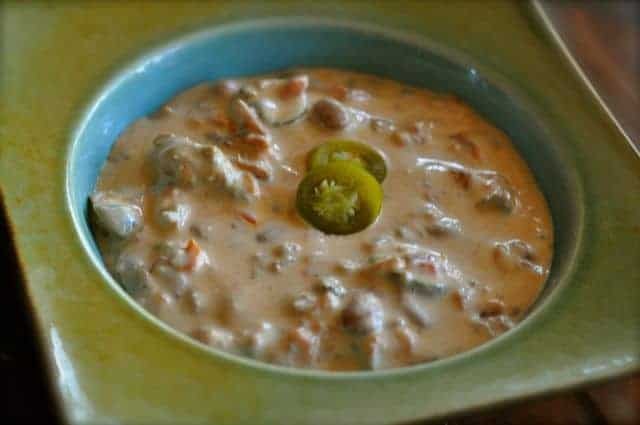 This isn’t your normal rotel style cheese dip, this contains hamburger, ranch style beans, and so much more. This is an amazing dip, it starts with your traditional Rotel Dip, but it goes much further. This dip adds ground meat, cream of mushroom soup, green chilies and so much more. Looking for a dip that will make a really large amount, this is the perfect dip for you. Love Dips? Check out these great party dips! Creamy Tacos Dip is the perfect dip for a party. Cook and season meat. In a very large pot heat all of the ingredients together. This makes a very large quantity of cheese dip. Very tasty stuff, and perfect for a large party. Looking for a recipe for the cheese sauce that Bar Louie’s uses on their tater tots. I’m searching for a sauce served with their chips at Chuy’s….wow it is so good. I have your OLD recipe for Casa Ole’ Green Sauce and its just not quite as good. Got any hints on how to copy Chuy’s sauce??? Thank you.